Anti-Defamation League Calls On Paul Ryan To Censure Steve King For "Anti-Semitic And Offensive" Actions - Joe.My.God. 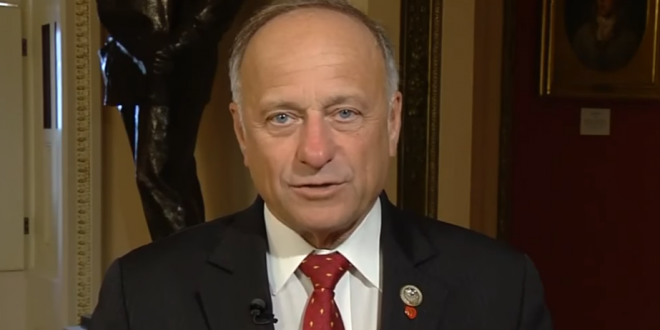 The national director and CEO of the Anti-Defamation League, Jonathan Greenblatt, urged House Speaker Paul Ryan in a letter on Tuesday to take action against Rep. Steve King (R-Iowa) by stripping him of his subcommittee chairmanship and initiating censure proceedings for King’s “anti-Semitic and offensive” actions. Agricultural dairy cooperative Land O’Lakes pulled its support on Tuesday for U.S. Representative Steve King, an Iowa Republican whose past inflammatory comments on immigration and race drew renewed scrutiny after the massacre at a Pittsburgh synagogue. “We take our civic responsibility seriously, want our contributions to be a positive force for good and also seek to ensure that recipients of our contributions uphold our company’s values,” Minnesota-based Land O’Lakes, whose products include its eponymous butter, said in a statement. Rep. Steve Stivers (R-OH), chair of the National Republican Congressional Committee, the official campaign arm for House Republicans, condemned King’s comments and actions. A new poll from Change Research also shows King’s Democratic opponent J.D. Scholten, a former baseball player and paralegal, polling within a single digit of King.